Previously, on MinerBumping... Rebel forces have struggled to come up with a coherent plan to counterattack the New Order, which is stomping all over highsec. Rebels have debated many different tactics, but have mostly settled on the strategy of producing large quantities of miner tears. Alac Carrel jumped at the opportunity to join a rebel fleet. Sadly, the text never came. Another rebel boldly predicted victory, "when the time is just right". For resistance fighters, these guys can be very picky. The timing is never quite right. 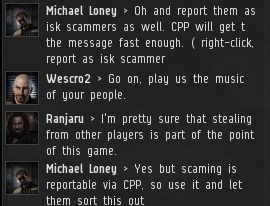 After losing his ship due to a Code violation, Michael Loney recommended his fellow miners petition us to CCP for the crime of scamming. 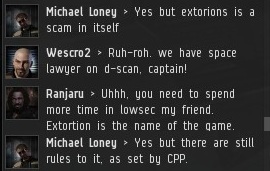 Despite being as wrong as possible, Michael was absolutely confident about his interpretation of the rules: There's no scamming in EVE, you see. He lectured everyone in system about the finer points of the EULA. If it only it were possible to bottle up a space lawyer's confidence and sell it. Kendra Valen didn't think it was against the rules to gank miners, but she had faith that CCP would put a stop to it eventually. As I've always said, this is what carebears want. They're not interested in balancing game mechanics and all that other jazz. They just want highsec to be 100% safe for AFK mining. Oh, and it has to be highly profitable, too. Meanwhile, Neckbeard TheFierce encouraged others to put a (bigger) bounty on me, though the bounty has had zero effect, since it doesn't make killing an Invincible Stabber any easier--or more tempting, given the bounty formula. I predicted this months ago, but that hasn't stopped the carebears from wasting money on ludicrous bounties for me and Agents of the New Order. Then there's the phantom nullsec merc corp that never arrives. Part of the problem may be that nullsec mercenaries don't spend much time in highsec. And, to the extent the mercenaries exist, they know a bad deal when they see one. 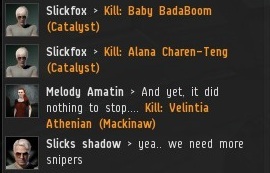 A rebel sniper proudly trumpeted "his" Catalyst kills, which did nothing since it was Concord that did the work. Since snipers generally can't kill a Catalyst until faction police or Concord arrive, they have no effect on the gank. Even on the rare occasions that they do kill a Catalyst a second or two before the police show up, it shaves only a fraction of the DPS from one Catalyst, which itself represents only a fraction of the gang. Perhaps that's why after participating in several dozen ganks, I have never actually witnessed rebels successfully prevent a gank. I'm told it's happened before, but basically they sit in the ice fields all day and watch helplessly as the miners die. If they linger too long, however, they occasionally find themselves in the crosshairs. After seeing one too many ganks succeed despite rebel interference, Corrin Javalle throws up his hands. It's impossible to stop the Knights of the Order. Carebears, behold your champion! In the end, the rebels have found themselves unable to do anything but cry--and suggest that other people stop us. Why? Because ultimately, the people who oppose us are people who support bots and bot-aspirancy. 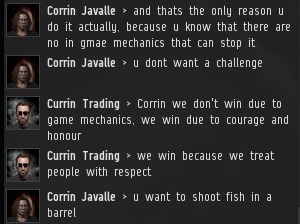 Their way of life in EVE is all about putting no effort into anything. It's hard to fight when you're AFK. Those who do want to play EVE end up joining the New Order, where they belong. Those who do want to play EVE go to low or null sec, where the there's actually a challenge. Even if you're obsessed with pve, you shouldn't be in high sec... find a wormhole. Many of us are no strangers to lowsec and/or nullsec and/or w-space. That said, the challenge in the New Order's work is not just in killing individual NPC imitators (who are no more difficult to slay than NPCs), but in building a community around what we do. Under our banner, pilots of all persuasions work together for the betterment of New Eden - from the Agent to the Knight, from the logistics expert to the fleet commander, from the scout to the spy. This is perhaps the highest form of MMORPG gameplay - engaging with other players to create something greater than the sum of it's parts (or participants), instead of shooting more difficult NPCs or exposing oneself to arbitrary, meaningless risk from player pirates. 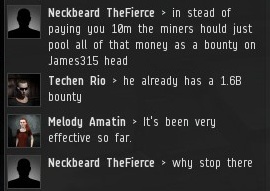 Miners should go to lowsec too, you know, for challenge. Or are they somehow above your "honour scale", Mr. Anonymous. Did you try it? But to answer your concern i am not sure this is for challenge, it's for human interaction in this case collecting buckets and buckets of tears. And i must add this business it's booming. 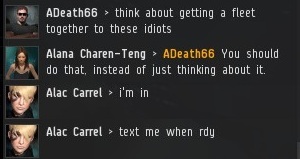 From the bounty notifications on some of the gankers can one tell who and when a ganker gets shot. So far do the notifications go as high as 3m ISKs. Sometimes the notifications on a single character occur fast after another, which indicates a pod kill after a ship kill. I don't really care if gankers shoot each other over the bounties, but if they do then it is actually quite entertaining, because it is an undeniable sign of madness. You mean it's a sign of intelligence, recognizing that we can shoot each other to basically profit from you, while continuing to have tremendous amounts of fun at the expense of those who refuse to adapt. No, I mean it makes me laugh like two circus clowns who slap each other. If the gankers shoot one round in the end of the gank each other they can collect the bounty for themselves, and only the guy who put the bounty in the first place it's the "village idiot". I must admit i wasn't think about this tactic but seems douable and very effective in the end. Madness; hmm i am not sure about this because clearly it's fun and lucrative. I can imagine it gets boring fast. The payouts are still small as they do not yet fly anything much of value and it will take a long time until the bounties have disappeared. One should then never forgot that it always implies a 5 times higher loss in ISKs. A miner who sits afk in a belt makes about as much ISKs only with his drones when they kill belt rats. In order to make a small fortune from piracy you need to start with a big fortune. Here it's the same: you lose isk but you gain alot of fun. What is the difference between an Agent of the New Order and a Knight? An Agent refers to anyone (including a Knight) who takes action to advance the cause of the New Order. A Knight of the Order refers specifically to those who conduct suicide ganks for the New Order.